While iPhone fans are waiting for iPhone 6 and 6 Plus, may be people who just wanna give iPhone a try can get iPhone 5S at the lowest price ever. Yesterday, we posted about a major price cut in the iPhone 5S and 5C prices on major e-commerce sites like Flipkart and Amazon. On both of the popular e-commerce sites, we have seen major price cut for iPhone 5S and 5C, especially 5C is now getting more affordable for people. Till now, it was an e-commerce stuff but now looks like Apple also followed the way of e-commerce sites and officially made price cuts for iPhone 5S. The bigger iPhones are coming soon, but the older iPhone 5S and 5C will still remain at the market. And this decision by Apple wil be surely welcomed by the Indian users. Mumbai-based retailer Mahesh Telecom has tweeted that Apple has given an official price cut to the two iPhone 5S variants ahead of the India launch of iPhone 6 and iPhone 6 Plus. According to the tweet, iPhone 5S 16GB will now cost Rs 44,500, down from Rs 53,500. Similarly, iPhone 5S 32GB’s official price has come down from Rs 62,500 to Rs 49,500. So this is what Mahesh Telecom posted. 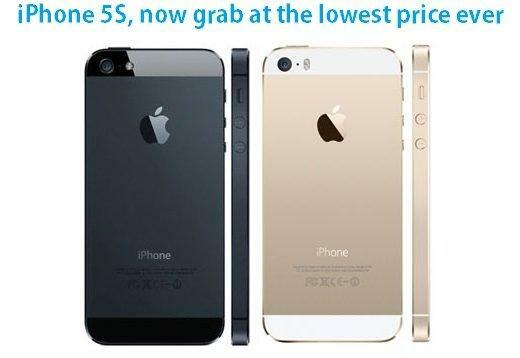 However you can purchase the base variant of iPhone 5S online for much less. Online retailer Amazon.in is selling iPhone 5S 16GB for Rs 34,999, while the same model costs Rs 36,000. The iPhone 5S Gold 16 GB variant is now available for just 36K INR on Flipkart, while the while the Space Gray and Silver 16 GB variants now cost around 42K INR. You can also check out the iPhone 5C price cut information and price details in our previous post.